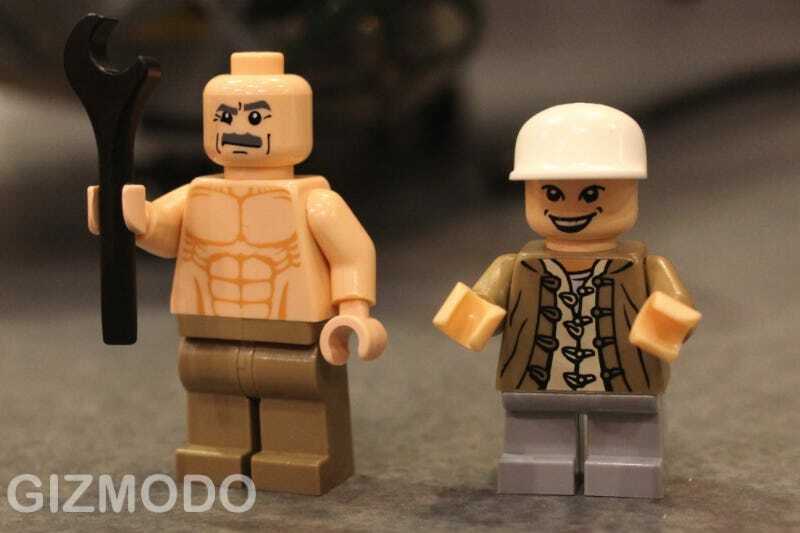 The new Indiana Jones Lego sets are awesome. Not only do they adorably recreate several classic scenes from the three non-retarded Indy flicks, they've evolved the minifig to new heights: Short Round heights. That's Short Round there on the right in the top photo, next to the beefy Egyptian Luftwaffe Nazi that gets diced up by the propellers at the end of Raiders. And here's Connery, in the back of the biplane, before haplessly shredding the rudder with his machine gun. Oh Dad. You can recreate all of those scenes, along with the heart-removal from Temple of Doom (KALI-MA), the Venice Canal chase with the fez-wearing Brotherhood of Grail protectors, and the old-timey Shanghai car chase from the beginning of Temple of Doom, where you can find the aforementioned Short Round (note the half-length legs).